Christopher C. Quick/Fleet Specialist Inc. 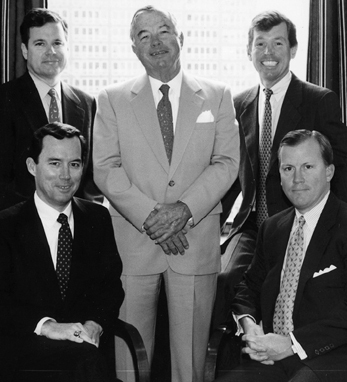 Heading up one of the largest specialist firms on the New York Stock Exchange is Christopher Quick, the CEO of Fleet Specialist Inc., a unit of FleetBoston Financial Corp. (Quick is pictured seated right with his late father, Leslie Quick, Jr., and three brothers. See list for profiles on Peter Quick, Thomas Quick, and Leslie Quick III.) Fleet Specialist is a leading national financial services firm with assets exceeding $190 billion. Quick was instrumental in the acquisition of Colin Hochstin by Quick & Reilly, which would later become Fleet Meehan Specialist. He was appointed president in 1986. Holding executive positions in the specialist business for more than 20 years, Quick began his career after earning his BS in finance from Fairfield University, of which he is a member of the Trustee Advisory Board. He is also a member of the NYSE’s board of directors and a trustee of St. Vincent’s Medical Center. He is a Knight of Malta and serves on the Board of Trustees of the New York Foundling Hospital. He and his wife Ann reside in Westchester County with their four daughters.